King Tracking is the home of all the latest GPS tracking gadgets. King Tracking's GPS products are able to track vehicles, children, the elderly, paintings, antiques, jewelry, boats, helicopters, fleets, containers, and more. Each tracker is unique for each person so King Tracking offers a variety of GPS products utilizing satellites that triangulate the coordinates on regular intervals. Leo Minor 609408027024 is a portable device that fits in the palm of your hand and has motion detection as well. Leo Minor FCC ID: ZKO-TT8850 can track vehicles, people, or assets. The battery will last two and a half weeks and is rechargeable. Leo Minor FCC ID: ZKO-TT8850 has a FREE carry pouch. The FREE carry pouch can hold Leo Minor as well as be used as a jewelry case to protect valuables. The magnetic clip is another accessory that attaches to the back of Leo Minor FCC ID: ZKO-TT8850 and then attaches to any magnetic surface. The extended battery provides Leo Minor with three months of extended battery use and has a strong magnet on the bottom that can be used to attach to the top side of the frame of a vehicle. The hard wire power kit increases the versatility of Leo Minor by connecting Leo Minor to the car itself. This keeps Leo Minor constantly charged through the vehicle. The car charger is used to keep Leo Minor charged through the vehicle's cigarette lighter. The cigarette lighter can normally be found in the front of the car near thet console or in the trunk of the vehicle. The Pelican Case is a magnetic case that is used to protect Leo Minor from extreme conditions such as freezing temperatures, rain, and snow. Leo OBD 609408015144 installs within seconds and provides real time tracking. 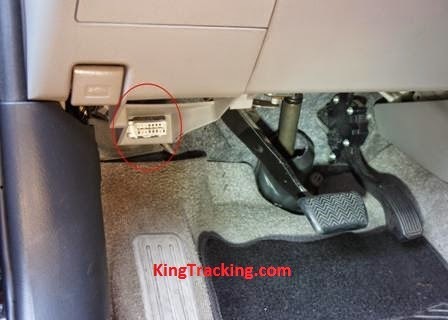 Leo OBD is the second type of GPS tracker offered from King Tracking. Leo OBD's battery runs off of the car. Leo OBD 609408015144 installs in the OBD ii port of any vehicle. All cars manufactured after 1996 are required to have an OBD port. The OBD ii port is normally located directly underneath the steering column. The extended "Y Cable" is used to conceal the Leo OBD tracker, while at the same time keeping the port open for service. The Kill switch relay is used to remotely disable the ignition from any location. If you believe your car has been stolen or somebody is accessing it without your permission, remotely disable the ignition. Leo Kill Switch is hard wired into the vehicle and will require professional installation. Leo Kill Switch will provide updates every minute as well as alerts if the ignition is on or off. The software for King Tracking's trackers can be tracked on any PC, Mac, smart phone, tablet, or iPAD. When logged in, the software will display the battery life to let you know if the device needs to be charged. The map view will provide you with a green indicator dot that will let you know the exact location of your GPS tracking device. Hybrid view is also available with our GPS tracking software. Zoom in with satellite view to see the buildings, beaches, and other landmarks in the surrounding area. Street view will provide you an up close view of the location and help you to further pinpoint the exact location of the device. The breadcrumb trail will provide a visual view of the all events report. The breadcrumb trail will show the start and finish point for a set amount of time. Alerts may be configured to notify you by text message and/or email of when the vehicle is in motion, excessive speeds, hard braking, perimeter violations, and more. The dashboard view will allow you to receive up to a one year history of your GPS tracking device. View the miles per hour as well as set up perimeters. Track multiple vehicles at once with fleet tracking. Know the location of all your employees if you are an employer. National coverage for GPS tracking is $29.95 per month ($59.95 Activation Fee). Worldwide coverage is also available ($25.00 per month with own sim card).